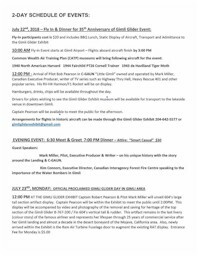 Air Canada Recreation Association (ACRA) 2018 Golf Tournament. Cut-off date is August 9, 2018 after that date accommodations will be on a space available basis. on the waterfront at Gimli, Manitoba. 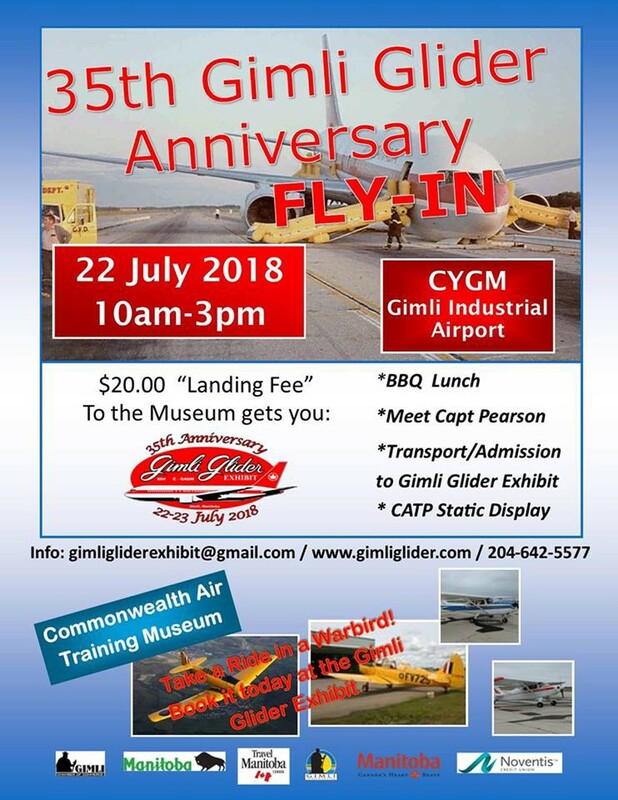 July 22 - All pilots and their passengers are invited to a Sunday of fun at the 35th Gimli Glider Anniversary Fly-In 10:00 to 15:00 Sunday, July 22nd at CYGM – Gimli Industrial Airport. 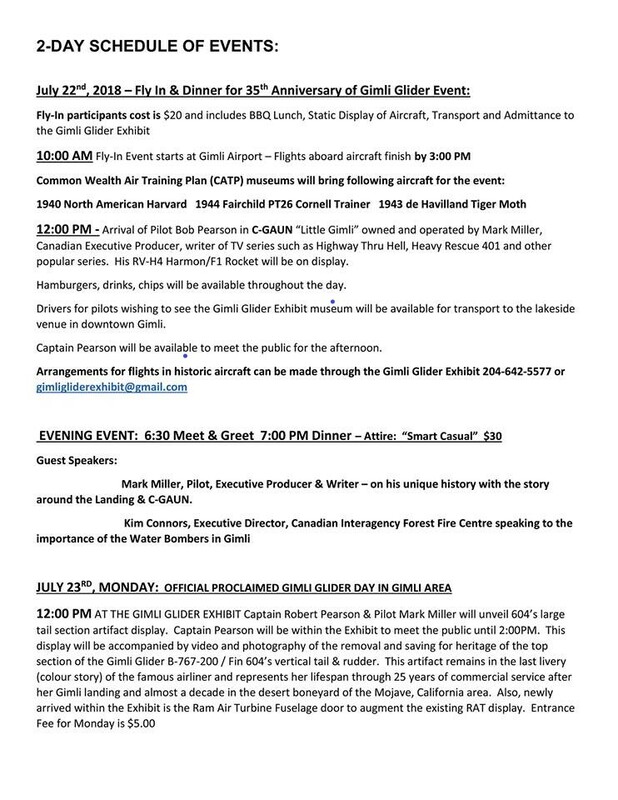 Hosted by the Gimli Glider Exhibit team, the Fly-In’s flight operations are directed by Steve Bannister, RCAF Lieutenant-Colonel retired. 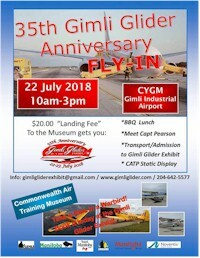 A nominal $20.00 “landing fee” gets pilots and their passengers a BBQ lunch, transportation and admission to the much acclaimed Gimli Glider Exhibit museum on the waterfront in downtown Gimli. Static Display of war-bird aircraft from The Commonwealth Air Training Plan Museum and the Opportunity to meet the famous Captain Pearson who performed that miracle of airmanship on July 23, 1983 gliding a both-engine-out B-767-233 long distance and landing it using a steep forward slip (due no-flaps) on the race-track/drag-strip on Gimli’s decommissioned runway 32L, saving the passengers & crew, plus the aircraft for 25 more years of service. 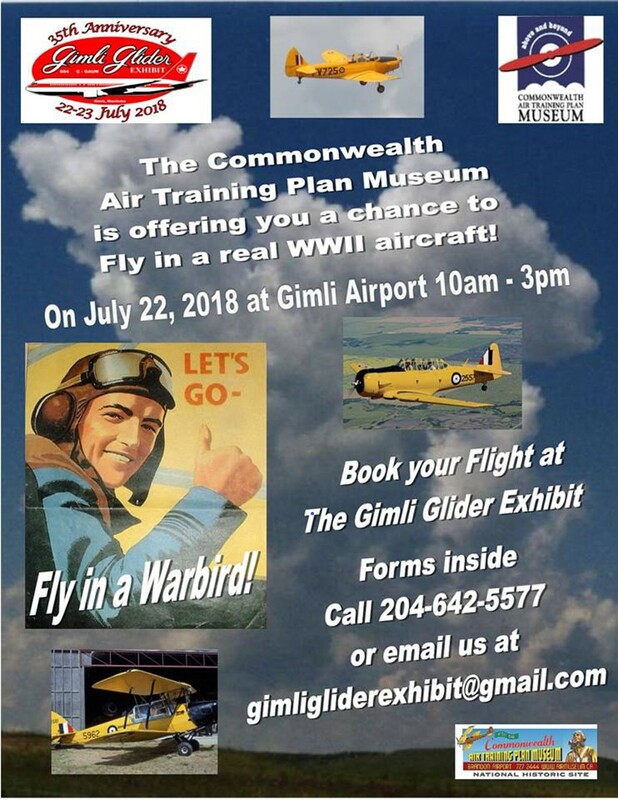 July 22, 2018 - at Gimli Industrial Airport (YGM) Sunday 10:00 – 3:00 pm. 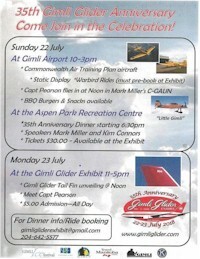 The family fun events include CATP static display & training war-bird rides, meet Captain Pearson as he flies into YGM at noon as passenger in Mark Miller’s Harmon Rocket competitive aerobatic aircraft “Little Gimli” that has registration C-GAUN that was the Gimli Glider’s original registration. (Note: Mark Miller is producer of reality TV shows Highway Thru Hell / Heavy Rescue 401, etc. and his major donation helped purchase 604’s upper tail fin). BBQ burgers & snacks available as well as CATP war-bird rides. 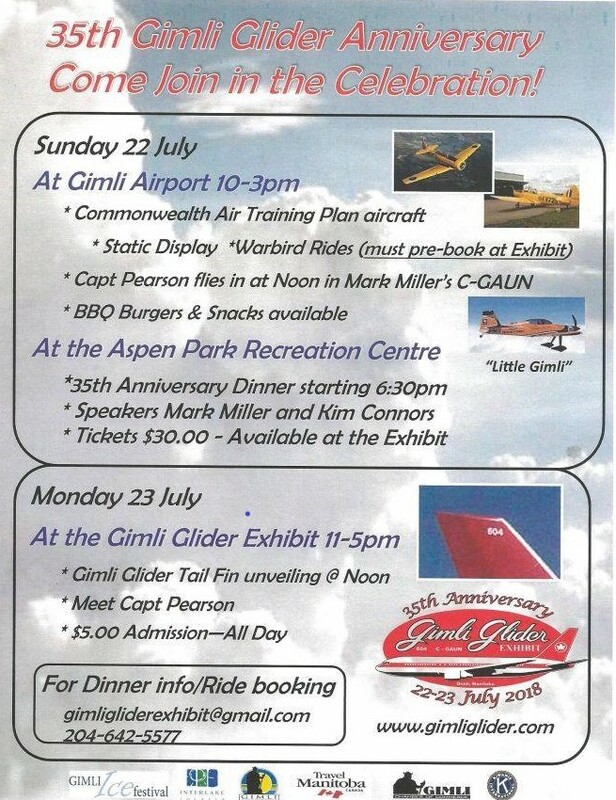 At the Aspen Park Recreation Centre, starting at 6:30 pm, it’s the 35th Gimli Glider Anniversary Dinner with speakers Mark Miller & Kim Connors. Tickets available at the GG Exhibit. Book dinner & war-bird rides via gimligliderexhibit@gmail.com. A reminder to readers who are Air Canada retirees that you can check ACAeronet for the Daily to keep up on the latest news. I was a teenager when a future brother-in-law came to pick up my sister during lunch hour. 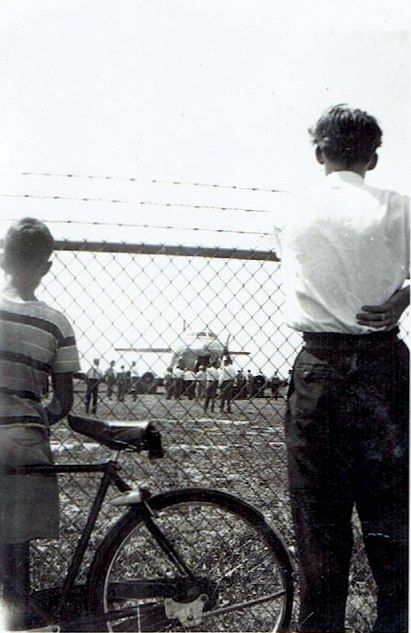 He had heard (probably on the radio) about the gear up landing that was being made by the Comet at Malton, Ontario. The C-102 had been designed to Trans-Canada Air Lines' requirement agreed to in 1946, which called for a 36 seat aircraft with a cruising speed of 425 miles per hour, a "still-air" range of 1,200 miles, an average distance between stops of 250 miles, with 500 miles as the longest leg requirement. Allowances were specified as 45 minutes stacking and flight time to a 120-mile alternate airport. Headwind was to be taken as 20 mph average, with 40 mph maximum. The first prototype, CF-EJD-X christened the Jetliner, first flew August 10, 1949, just 25 months after the design of the Derwent engine version was started! The crew consisted of Avro UK Chief test pilot Jimmy Orrel, Avro Canada Chief Test Pilot Don Rogers; and flight engineer Bill Baker. 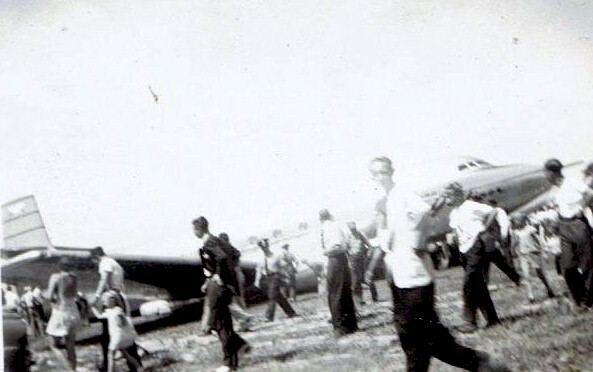 The first flight was without any problems and the only problem in over 500 hours of flight occurred on the second flight (August 16, 1949) when the aircraft had to make an emergency belly-landing because the main gear would not extend (the damage was so minor that the aircraft was flying within three weeks). Extracted from the "Horizons" magazine issue dated July 1983. Tony Butler, Victoria, B.C. ; Douglas Armitage, Richmond, B.C. ; Don Jarvis, Calgary, Alberta; Beth Ferguson, Winnipeg, Manitoba; Gord Smith, Toronto, Ontario; Mary Young, Ottawa, Ontario; Evelyn Desjardins, Montreal, Quebec; Tony Bruneau, Halifax, Nova Scotia; Roger Alain, Florida, USA. 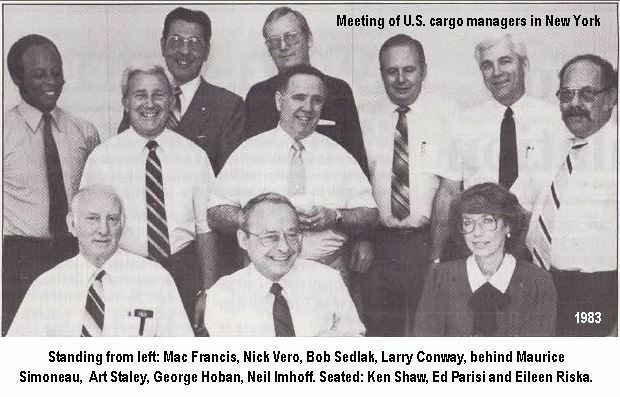 Ed Parisi, newly appointed Regional Cargo Sales & Service Manager for the U.S. & Southern Region, held a meeting with U.S. cargo managers in New York. Standing from the left: Mac Francis, San Francisco; Nick Vero, Miami; Bob Sedlak, Chicago; Larry Conway, LAX; behind - Maurice Simoneau, Boston; Art Staley, Tampa; George Hoban, New York; and Neil Imhoff. Seated from the left: Ken Shaw, Ed Parisi and Eileen Riska, secretary to Parisi. 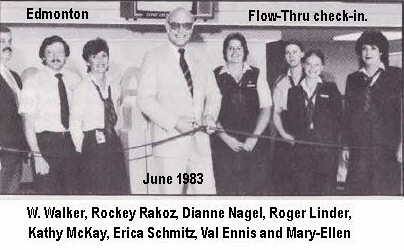 The first Flow-Thru check-in facility in the airline's domestic system was officially opened in Edmonton by Roger Linder, Senior V.P. , Marketing, Sales & Service, early June 1983. The counter facilities provide for smoother, more efficient passenger handling. Pictured with Roger Linder, who is cutting the ribbon at the official opening, are from the left: W. Walker, Passenger Service Manager; Passenger agents Rockey Rakoz, Dianne Nagel, Kathy McKay, Erica Schmitz, Val Ennis and Mary-Ellen Renaud. 1975 – November 3, - first flight Montreal - Pointe-a-Pitre, Guadeloupe. 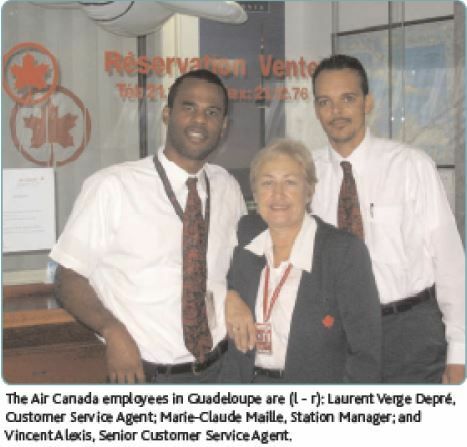 The Air Canada employees in Guadeloupe in 2005 were Laurent Verge Depre, Customer Service Agent, Marie-Claude Maille, Station Manager and Vincent Alexis, Senior Customer Service Agent. 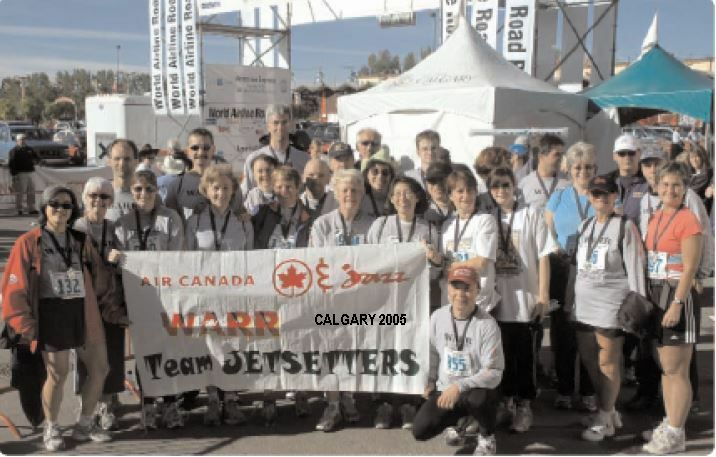 On Sunday, September 18, 2005, two teams of Air Canada employees took part in the seventh annual "Tug of War Defi 767 Challenge" in Montreal and placed in the top three. The 767 Challenge pits the strength of a team of 20 people pulling against the weight of an Airbus 321 (72,767 kilograms or 160,767 pounds) over a distance of 3.7 metres (12 foot) in the minimum possible amount of time. The event took place at the Air Canada base and raised $27,853 for Special Olympics Quebec. Here we have photos of both teams. 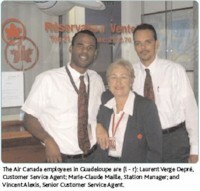 The station attendant team called themselves the "Air Canada Ramp Rats" and placed second in the fastest pull category. Unfortunately, there are no names supplied. 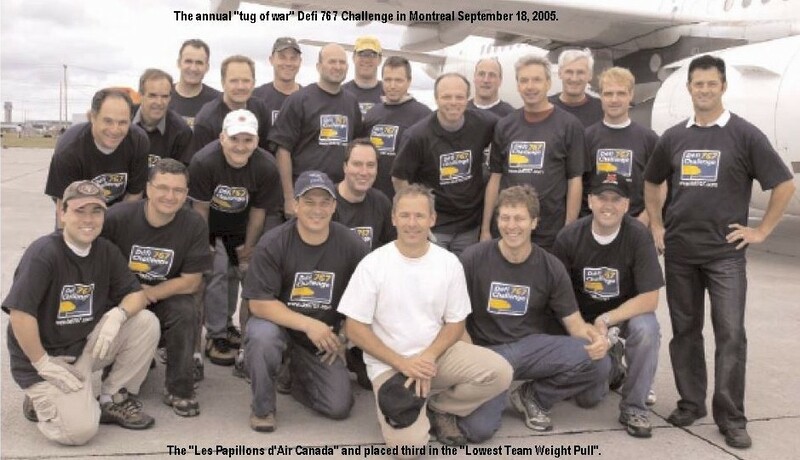 The pilots team were the "Les Papillons d'Air Canada" and placed third in the "Lowest Team Weight Pull". Unfortunately, there are no names supplied. 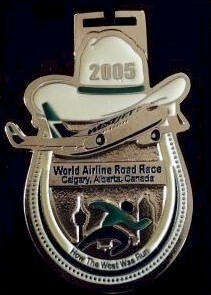 One thousand two hundred competitors met in Calgary during September 14 - 17, 2005. The combined Air Canada and Jazz team, named the "Jetsetters", were represented by more than 70 members. A total of 15 awards were their fair share of the trophies available. With many different countries and airlines represented, the event takes on an international flavour of a spirit of competition and airline friendships. Below are a few of the results (with time) for Air Canada participants. Click Here for the complete results. Category A - 1st Air Canada - 18798 points. Here we have the members from the "Jetsetters". Unfortunately, no names were provided. Improving customer service during Irregular Operations. New SMS/Email communications and self-service re-booking tool launched. Customer and employee feedback after the 2008 Christmas IROPs indicated we had a lot to improve upon when it came to communicating with and assisting our passengers during irregular operations. In many cases, customers had difficulties getting the latest status on their flight and/or re-booking options. Instead of receiving timely information proactively, customers faced either long lineups at the airport, or long waits in the Call Centre queue. Here we have this photo of the project team. 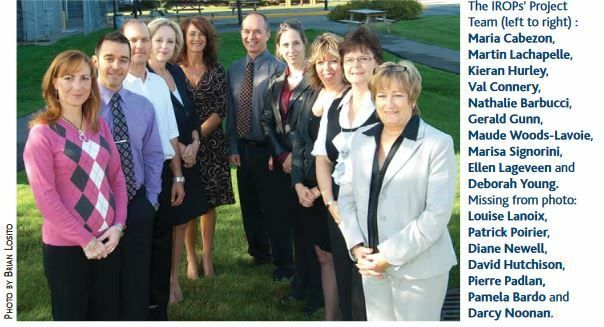 Left to right: Maria Cabezon, Martin Lachapelle, Kieran Hurley, Val Connery, Nathalie Barbucci, Gerald Gunn, Maude Woods-Lavoie, Marisa Signorini. Ellen Lageveen and Deborah Young. Missing from the photo: Louise Lanoix, Patrick Poirier, Diane Newell, David Hutchison, Pierre Padlan, Pamela Bardo and Darcy Noonan. 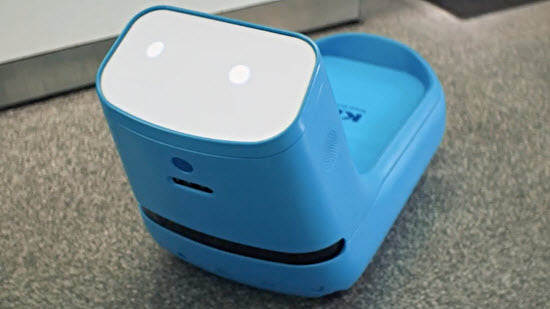 This ridiculously cute robot will transport your luggage at the airport. We’ve all overpacked before a flight, which means we've all had to haul that bulging suitcase through the airport while attempting to find our gate. But if KLM Royal Dutch Airlines has its way, you'll be able to give those weary arms a break — all thanks to robotics. Meet Care-E, the airline's friendly luggage trolley prototype. 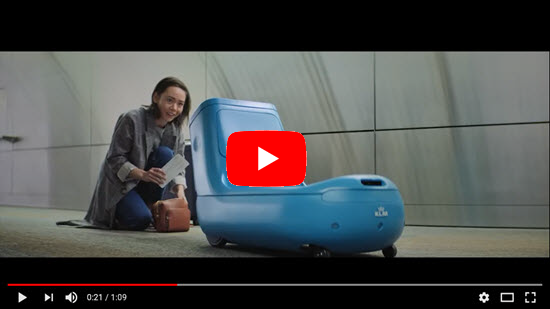 "KLM created Care-E, the self-driving trolley with a heart of gold. Care-E is there to guide passengers through the airport, carry bags, and be a friendly face along the journey." From the "Canadian Pacific COMPASS" magazine issue 1981. Canadian Pacific Air Lines began with 77 aircraft of many different kinds flying a tangled web of routes that made early operations difficult and was soon stretched to the limit. A year after its formation its airplanes flew 6.1 million miles with 9.5 million pounds of cargo. Sir Edward Beatty offered quick delivery of vitally needed airplanes to Britain by air instead of the slower sea route. The British government was ready to accept. Punch Dickins, the World War I ace and pioneer bush pilot, played a leading role in setting up the air ferry service. The "Empress of Sydney," a Canadair Four aircraft, made the first Canadian Pacific flight to Australia in July 1949. In 1949 a Canadian Pacific plane was the last flown out of Shanghai before Communist forces closed China traffic for many years to come. 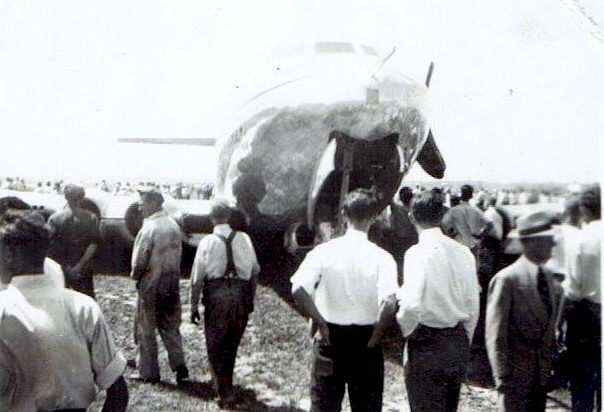 In 1947 train crews in Manitoba and Saskatchewan saw a different type of aircraft. Theirs was a mysterious unidentified flying object, bathed in blue light, which cruised by and suddenly disappeared. The airline extended Canadian Pacific operations to countries where it had never been active before, such as Mexico, Peru, Chile and Argentina. 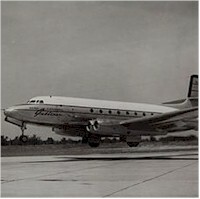 In 1955 the company began flights over the great circle route over the North Pole from Vancouver to Amsterdam. The great circle route is the shortest distance, on the circumference of the globe, from one point to another. 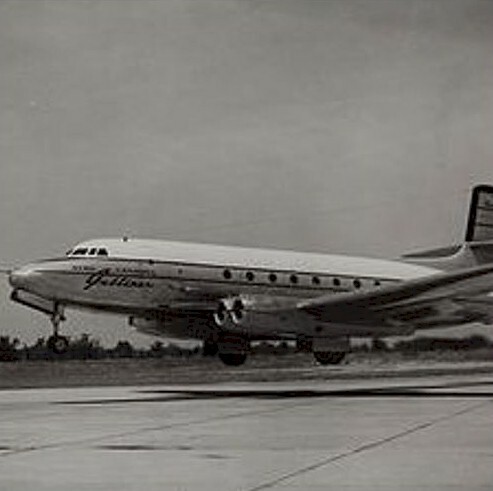 The first transcontinental flights made by the company were on May 4, 1959, between Montreal, Toronto, Winnipeg and Vancouver. Authorization was for one flight per day each way. On a recent trip to Cape Breton to visit family, I had some time to pass in YYZ and found myself reminiscing about my early days with Air Canada and my fascination with having the opportunity to work at Toronto (L.B. Pearson) International Airport. I found a seat from where I could see the original DC-8 hangar (where Purchasing and Supply were once located) and the “747 hangar”. I visualized where the Cargo facility, Terminal One (Aeroquay One) and Terminal Two had been. In the early eighties, it was about a three-kilometre trip to deliver parts from ‘Stores” to Terminal Two where Air Canada was the main customer. From the DC-8 hangar, we drove along a taxiway (Terminal Three has not yet been built) and then entered onto the tarmac and had to pass Terminal One very carefully on the way to deliver the part. Because “T1” was a unique design and was somewhat a squared circle in the middle of the tarmac, it was difficult to see a moving aircraft around the bend. Construction on Aeroquay One began in 1957, and it was opened in 1964 by then Prime Minister Lester B. Pearson. 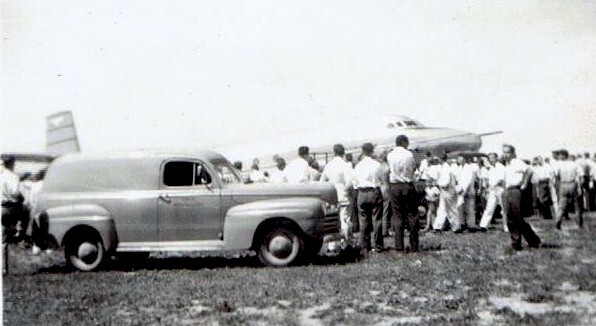 It replaced the “TCA” terminal which had been built in 1948 but kept a feature of that terminal; it was possible for the public to access the rooftop and have a view the aircraft movement around at the airport. In today’s world, this would probably not be possible due to security concerns. Built to accommodate the growth of Canada’s airline industry, it was operating beyond its capacity within a few years, and Terminal Two opened in 1973 to be Air Canada’s hub facility. A Google search of “Aeroquay One” returns quite a list of interesting historical information. Hugh MacCallum has sent this correction to the information sent in by Stuart Russell and featured in NetLetter nr 1392 under "Frontier tales from Pacific Western". The DEW Line site (Distant Early Warning) Fox Main at Hall Beach Nunavut N44’ 39” Latitude W63’36” Longitude in 1957. Perhaps another reader has spotted co-ordinates error of Hall Beach in CP Air, Canadian People Gallery? Adlair Aviation was established in 1983 by the late Willy Laserich, one of northern Canada’s pioneer bush pilots, who flew in the Arctic for over 50 years. It is that same pioneering spirit that drives the company today; they are a family owned and operated air charter service. Adlair is known for their safe and reliable charter service to the communities of the far north; although they can provide service almost anywhere you need to go. Adlair operates out of both Cambridge Bay, Nunavut, and Yellowknife, NWT. In 1927, British Columbia Airways was founded and operated from Lansdowne Road in Victoria. Among the craft flown from Lansdowne Field was British Columbia Airways’ (BCA) Ford Tri-Motor 4-AT-B monoplane G-CATX on regular service to Seattle. At the time the Ford Tri-Motor was the largest, most modern commercial aircraft in the world. January 1, 1928 – British Columbia Airways Ltd starts a flying school at Lansdowne Air Field with three small training planes. May 1928 – British Columbia Airways begins regular air service between Victoria, Vancouver, and Seattle. This is the first international air service in Western Canada. On August 25, 1928, BCA’s Tri-Motor departed Lansdowne Field on its regular service to Seattle with seven passengers aboard. Flying into fog on the American side of the Strait of Juan de Fuca, the plane went down with all aboard off the mouth of Discovery Bay west of Port Townsend on Washington’s Olympic Peninsula. At the time it was reported as “by far the worst catastrophe in the history of American commercial aviation”. BCA was completely exonerated for the crash though the commission recommended the use of seaplanes or amphibians rather than wheeled aircraft when flying over water from Victoria. It would be 15 years before another land-based aircraft linked Vancouver Island to the mainland. Monarch Inks Air Transat Line Maintenance Contract. Monarch Aircraft Engineering has signed a new line maintenance contract with Canadian carrier Air Transat. The new agreement covers full line maintenance support for the airline's fleet of Airbus A310 and A330 aircraft at Glasgow airport. 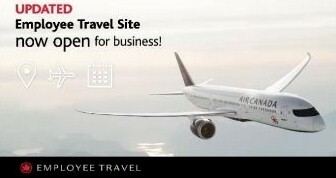 The Air Canada Employee Travel Site (ETS) website has just been updated. (Note: If you are planning for a future trip – we suggest you try the new layout to make yourself familiar with the changes – eds). New Canadian ULCC Jetlines firms A320 leases, eyes 2019 launch. Aspiring Canadian ultra-low-cost carrier (ULCC) Jetlines has firmed up a deal to lease two 12-year-old Airbus A320's from Dublin-based AerCap and plans to use them to launch operations, likely in early 2019. Vancouver-based Jetlines, which had planned to launch this month, has not announced a new start-up date. But the carrier said its first aircraft are slated to be delivered “before the first half” of next year, suggesting an early 2019 start-up. Lukas Johnson was named Jetlines CEO May 2018 after more than eight years at Las Vegas-based ULCC. Allegiant Air, where he helped the carrier introduce its first A320s and established a plan to become an all-Airbus carrier by the end of this year. Jetlines signed a tentative deal to lease the two A320's on April 23, one month before Johnson’s hiring was announced. The carrier originally planned to launch with Boeing B737-800's. It also has a letter of intent and has made at least two pre-delivery deposit payments on order for five B737-7's and options on 16 more, including conversion rights to B737-8's. Canadian ULCC Flair Airlines on June 15 launched flights from three new airports—Calgary, Halifax and Victoria - stretching its all-domestic network from coast-to-coast and setting up more direct competition with other carriers. USD 775.00 per person double occupancy; USD 1,040.00 single occupancy. Four nights twin share accommodation at the Hotel Sokos Olympia Garden (or equivalent). Tours as specified in the itinerary in modern air-conditioned coaches with English speaking guides and gratuity included. Transfers airport/hotel/airport as specified in the itinerary. Invitation to attend the package for the Russian authorities to be arranged by WACA. USD 20.00 per person WACA fee. USD 85.00 per person to attend the opera. Personal expenses, e.g. drinks, meals (unless specified in the programme), laundry, telephone calls, Internet access, optional tours, etc. Miles to Millions by Bill Grenier. The dim instrument lights reflect on the faces of the 3-man crew of an Air Canada B747 approaching V1 on the rain-swept active at London’s Heathrow. The first officer that night was our author, Bill Grenier, who explains that something had caused him to look toward the left seat. That “something” was the fact that the captain had slumped over in his seat and was no longer involved in the takeoff process. 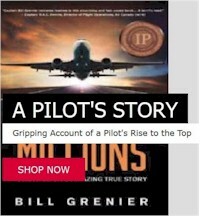 This is how Bill Grenier opens his book, and the excitement builds as this pilot relates his flying experiences from ab initio days to senior captain of the line, all revealed in a page-turner he calls Miles to Millions. Those “Millions” aren’t miles, by the way, but dollars earned, as we are treated to how high finance became a dual profession for this pilot. Bill’s life reads like a Dow Jones Average on wings. Prices at CDN $35.95 includes shipping in Canada. Here we have this cartoon by Dave Mathias which appeared in the "Between Ourselves" magazine issue June 1966. 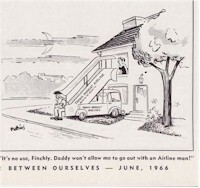 With the caption "It's no use Finchly, Daddy won't allow me to go out with an airline man!"